I was thinking about addiction this morning while reading all the last minute Apple speculation and remembered it was time to look at my Quitter app. 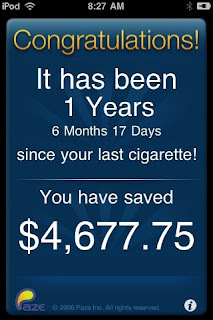 After years of trying to quit I finally decided it was time. I still have the pack that I was smoking on my shelf at work just in case of an email server meltdown or comet strike. I will not lie, it was very difficult to put down, but the hard parts only lasted 3 or 4 months which is not too bad for a 25 year habit. I am certain that had I not quit, I would not be able to handle the 6 miles a day I am logging on the elliptical machine. On the day I quit I loaded an iPhone app called quitter on my iPod touch. Based on 30 cigs a day at $5.50 a pack here are the results of stopping. Viruses and Spyware Oh My!